Musings on Micro-transactions after getting ripped off — GamingWithSwag.com - Dads By Day, Gamers By Night. Micro-transactions typically get gamers angry, but I have often been a defender of the practice for long running games that don't have an upfront cost. The game has developers who deserve to be paid for their job, and we should pay for things we enjoy. Having said that I expect return on my investment and I do not like games that require Micro-transactions to functionally play, and I don't like them when they come in games that have hefty price tags of their own. I recently was discussing Star Wars: Galaxy of Heroes as a fun free game that you can enjoy without spending a cent if you want to, but after playing for awhile and earning and buying some of their in game currency I have to say it is almost abusive how terribly they value your money. The top picture below is the marketing for their "best value" Mega-pack where you can get between 5-100 tokens for dozens of characters and ships which will unlock or upgrade your collection. The value if purchased with cash is about $20 dollars. What I got is shown in the second picture.. This is the second pack i have bought in the game, the first one I did send some money as I wanted to see how it was valued when I did my initial review and it was terrible then as well. That pack was only for characters and was advertised as getting between 5-330 for 8 characters. In both cases it was exclusively the low side of the spectrum, and I bet most of you thought that with multiple items between 5 and 100 that you would get a variety of results perhaps averaging in the middle, so this feels like a little bait and switch to not get a single item above 10. For context, you need 25 for low level characters and 80-150 for stronger characters so getting 10 for Darth Maul is essentially useless, like giving your 16 year old a picture of a car for their birthday. Hey spend another $200 on our game and you could play with him...maybe. This $20 dollar valuation got me nothing I could use digitally and nothing was unlocked, and so is a terrible waste of people's money or time as it took me several weeks to earn the credits to buy that pack. Needless to say, the enjoyment of the game has died. As an ongoing gaming experience I understand stringing people along and delaying some gratification, but when $20 gets you nothing useful its time to stop giving them your money and maybe your time. Twenty bucks should get you an entire game, or a new lengthy expansion as it is a third of a full retail game's price. We play games to escape bitter realities, and in this case my money actually goes further in real life. In fact, speaking of Darth Maul I could get a book, an action figure, and a DVD. 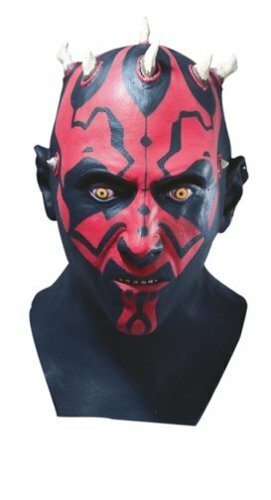 Heck I could get a mask and BECOME Darth Maul for under 20 bucks. Really puts things in perspective. For those who are curious this game is produced by EA.